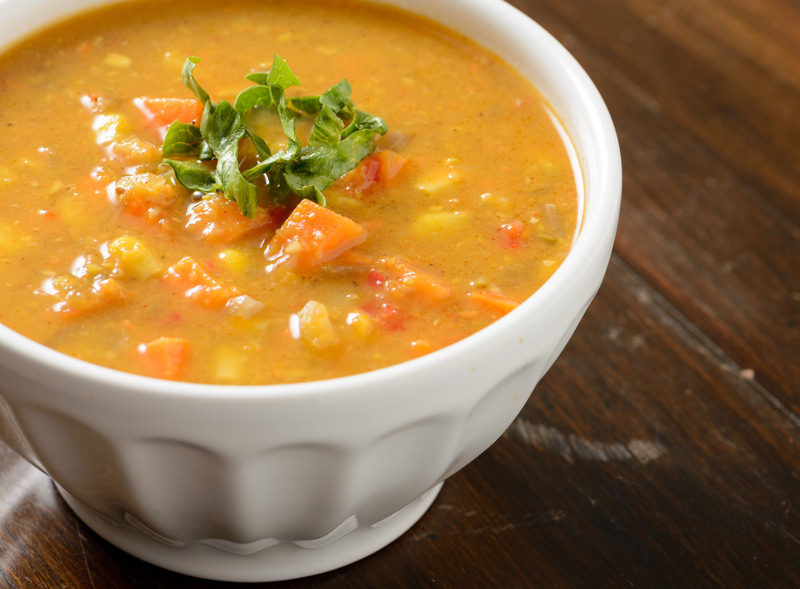 Perfect on a chilly winter day, these hearty corn and sweet potato soup recipe is sure to please. Heat the oil in a large soup pan and gently fry the onion until soft (approximately 5 minutes). Add the garlic and gently fry for another 2 minutes. Add 1/14 cups of vegetable stock to the pan. Bring to a boil, reduce heat and simmer for 10 minutes. Add the cumin and diced sweet potato and simmer a further 10 minutes. Season to taste and add the corn and remaining stock. Simmer approximately 10 minutes. Remove soup from heat and let cool slightly. Transfer half of the soup to a blender or food processor and blend until smooth. Stir the smooth soup into the pan and mix together with the chunky remaining soup and gently stir together. Serve into warm bowls with lime wedges on the side.